One by one, on a crisp winter evening in downtown Sacramento, the lawmakers shed their coats and ducked into the confines of a darkened lounge not unlike many others in the state capitol where power is brokered and deals are made. But instead of huddling up at the bar or in a private room, each leader strode up to a canvas on a back wall to engage in a ritual often immortalized by children on a simple piece of paper: tracing their fingers with a colored marker to create a memorable handprint. And while children often engage in this ritual with the guidance of teachers or parents, these state lawmakers – including Assembly Speaker Anthony Rendon, Senator Richard Pan and Assemblymember Adrin Nazarian – were guided by their personal passion to improve the lives of California’s early educators, parents and youngest constituents – the children themselves. From ECE to family strengthening, health care to home visiting, the legislators discussed their support for issues affecting young children with First 5 representatives drawn to Sacramento from all corners of the state. The gathering was a reception that preceded the First 5 Association of California Advocacy Day on January 31. 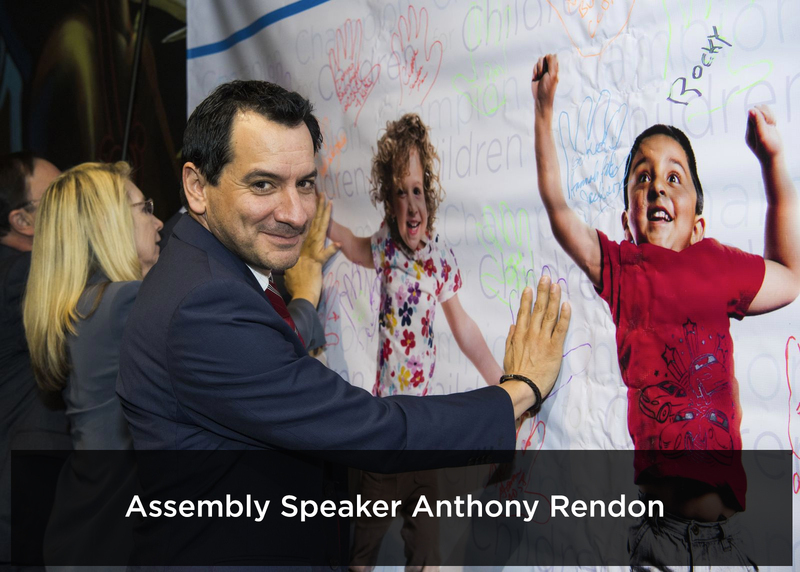 Assembly Speaker Anthony Rendon (D-Paramount), a 20-year veteran of early childhood education, expressed his concerns about plans in Washington, D.C. to repeal Obamacare and the impact on young children at home and in the classroom. “It’s hard for a kid to stay ahead and focused on school if they are not in good health or in pain,” Rendon said. First 5 LA’s Kim Belshé introduced Assemblymember Adrin Nazarian (D-Sherman Oaks), who was honored as a First 5 Champion for Children. This recognition reflected the Assemblymember’s legislative work last year that put an end to the diversion of tobacco revenue funds away from kids and towards Board of Equalization administrative costs. And if Advocacy Day was any example, that work is going – and growing – stronger than ever. During this fourth annual Advocacy Day, more than 110 First 5 staff and Commissioners from 39 First 5 County Commissions held 97 meetings with the legislators and their staff as well as key meetings with the Governor's Office, Lt. Governor's Office, the Women's Caucus, and various government agencies. The First 5 LA delegation, which attended 25 of these meetings, included Commissioners Duane Dennis and Marlene Zepeda, Executive Director Kim Belshé, Vice President of Policy and Strategy Kim Pattillo Brownson, Public Policy and Government Affairs Director Peter Barth and Government Affairs Strategist Tessa Charnofsky. The meetings could not have come at a more important time. Just weeks earlier, California Gov. Jerry Brown announced in his budget proposal that he was suspending a previously promised funding increase in 2017-18 for nearly 3,000 new preschool slots in the state. Brown’s proposed budget also defers increases to child care provider reimbursement rates which he earlier promised through 2020. The governor’s proposal has drawn concern from parents and child advocates even as a new poll reveals that child care and preschool costs are forcing many parents to make difficult tradeoffs. Research reveals that high-quality early childhood programs deliver an annual return of 13 percent per child on upfront costs through better outcomes in education, health, employment and social behavior in the decades that follow. A survey last year found that 67 percent of likely voters in California say the state government should fund voluntary preschool programs for all four-years-olds in California. Despite these findings and public support, more than 1.2 million eligible children still are not enrolled in subsidized child care because there isn’t enough state funding, as noted in an Op-Ed by Belshé and First 5 Association Executive Director Moira Kenney that ran in the Sacramento Bee on Advocacy Day. Indeed, the lack of – and access to – affordable, quality child care was an issue among those representing First 5s in both the urban and rural areas of the Golden State. First 5 Tulare Executive Director Michele Morrow told the story of a little girl with a birth issue who was in – then out of – early care and education. For some, the early care and education issue hit even closer to home. First 5 Humboldt Executive Director Mary Ann Hansen, who inquired about private child care for her 1-year-old granddaughter, was informed that the next opening would be in the fall . . . of 2018. “When you are looking at how difficult it can be for people in rural areas to travel to child care, the lack of slots is a real issue for families,” Hansen said. In addition to bridging both rural and urban areas, child care is an issue crosses both sides of the political aisle, said First 5 Commissioner Duane Dennis. 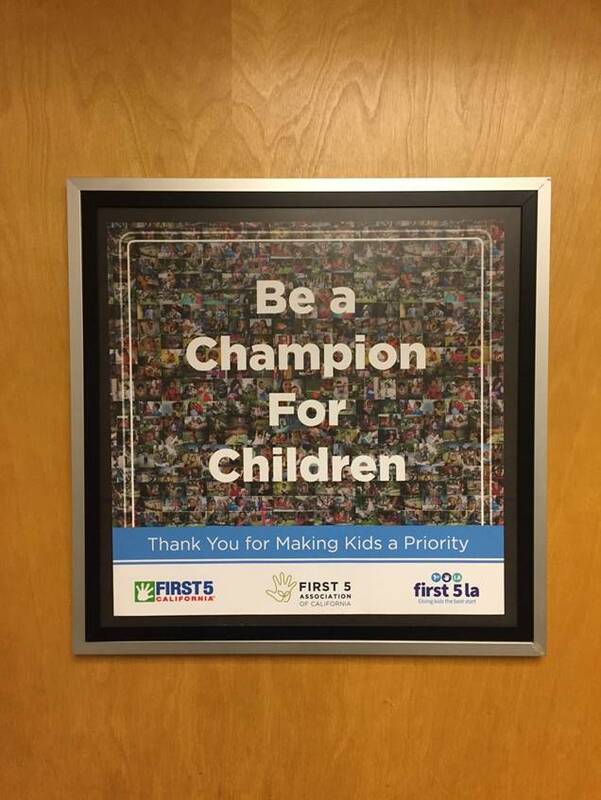 As the meetings began, signs of support for young children – and First 5s – could be seen proudly displayed on several lawmakers’ doors in the halls of the state capitol. Behind these doors, First 5 delegations were warmly welcomed by legislators and their staff with open ears and a respect on both sides for past policy and advocacy efforts on behalf of young children. 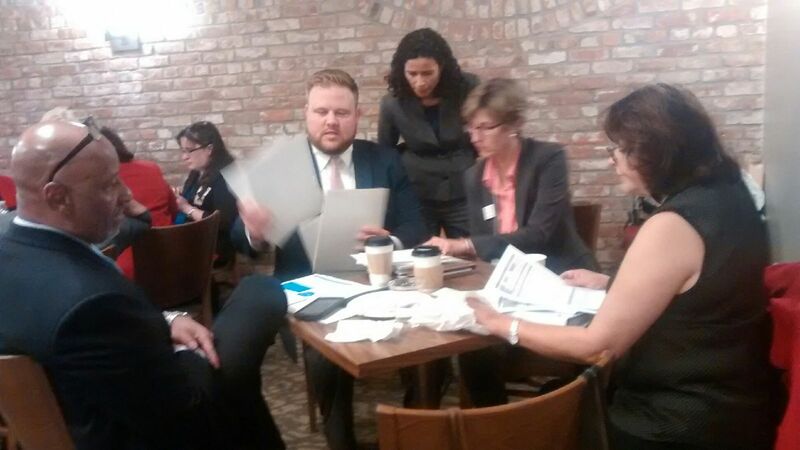 One of those meetings was with Senate President Pro Tempore Kevin De Le?n’s education consultant, Kimberly Rodriguez. The meeting, which included representatives from First 5 LA, the First 5 Association and First 5 California, quickly got down to brass tacks. “While we’re excited about the success we’ve had in recent years and appreciate the Senator’s support, we’re very concerned about the governor’s pause in child care,” Belshé said. “There are many things First 5s can do to be a resource,” Belshé said. 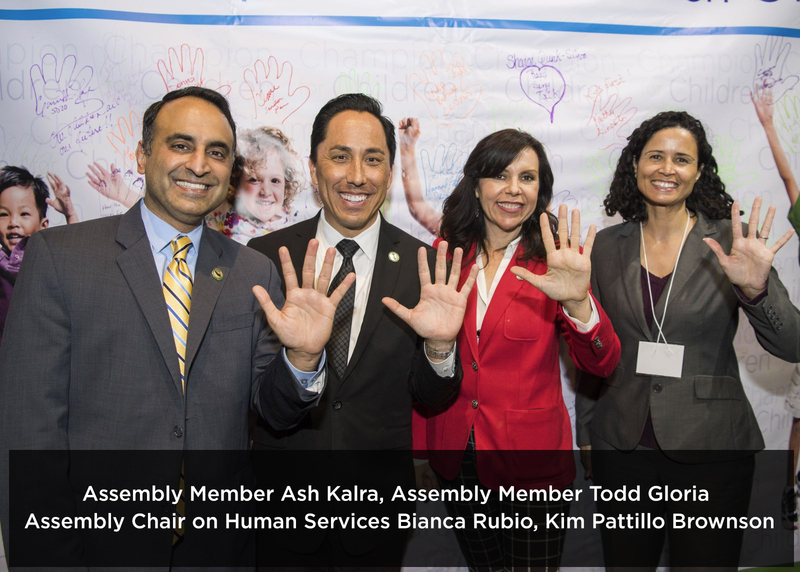 This productive interaction reflects how past Advocacy Days and a continued presence in Sacramento through California Strategies has helped lawmakers become familiar with the work and priorities of First 5s. “Instead of having to explain what First 5s do, we can go in to meetings and immediately have discussions about policy and advocacy,” Pattillo Brownson noted. “What we’re seeing is that the legislators are prioritizing children in a more concrete way than they ever have before,” Kenney said. Even newly-elected State Senator Henry Stern – in office for less than a month – welcomed a First 5 delegation to his office. A former educator himself, Stern was eager to discuss early care and education. Developmental screenings. Home visiting. Oral Health. Trauma-informed systems change. Family strengthening. While ECE was a common topic on many meeting agendas, First 5s brought a plethora of other priorities to the table with lawmakers. Meeting with State Senator Ed Hernandez (D – West Covina) to highlight the importance of home visiting, Belshé spoke of the impact of First 5 LA’s largest investment, Welcome Baby – a free, voluntary program in 14 birthing hospitals in L.A. County that provides pregnant and new moms with information, support and home visits with a professional parent coach. “We want to support parents at the earliest moments possible,” Belshé explained of the program, which when fully implemented will affect more than 25,000 births in L.A. County. “Welcome Baby teaches new parents about breastfeeding and early childhood development, supports them to create a learning environment at home, and connects them to services and supports in the community.”First 5 LA Director of Public Policy & Government Affairs Peter Barth brought home visiting even closer to the Senator’s home. “Queen of the Valley Hospital in West Covina is a Welcome Baby hospital in your district,” Barth noted. His curiosity piqued, Hernandez proceeded to ask a number of questions about Welcome Baby, all answered by Belshé, Barth and John Benton of California Strategies. As California is without a state-funded home visiting investment of its own, Belshé noted that First 5 LA’s work in this arena can serve as a learning model for any possible future home visiting investment by the state. Indeed, it was this expertise about early childhood, parenting and systems among First 5s that many legislators, staff and state officials in Sacramento found the most valuable. “I’m very appreciative to First 5s because they have been easy to go to for an understanding of what is happening with young children and families from L.A. to Yolo counties,” said Elizabeth Hannah Fuller, a consultant for the California Legislative Women’s Caucus, who also cited research and data provided by First 5s. In a meeting surrounded by representatives from First 5 LA, First 5 Marin Executive Director Amy Reisch, First 5 Fresno Executive Director Emilia Reyes, First 5 California Commissioner Lupe Jaime, and Kenney from the First 5 Association, Fuller listened intently as each highlighted their programs and offered to work together with the Caucus to improve outcomes for young children. “I love how you are all trying different things,” Fuller said. Fuller paid particular interest as Belshé and Pattillo Brownson discussed Welcome Baby and Project DULCE, a strategic partnership between First 5 LA and the Center for the Study of Social Policy to strengthen family protective factors by enhancing well baby checkups to support a child’s early development. Yet innovation comes at a price. And with First 5s facing fiscal challenges of their own with declining tobacco tax revenues (down to $350 million annually in 2016 from $650 million in 1998), the focus on advocating for policy and systems change that improve the lives of young children and their families at the county and state level are more important than ever. Ultimately, the conversation shifted back to the issue of child care. “Reimbursement rates for child care providers and having a living wage are important,” Pattillo Brownson said. Fuller nodded in agreement. For her, the issue was even more personal. 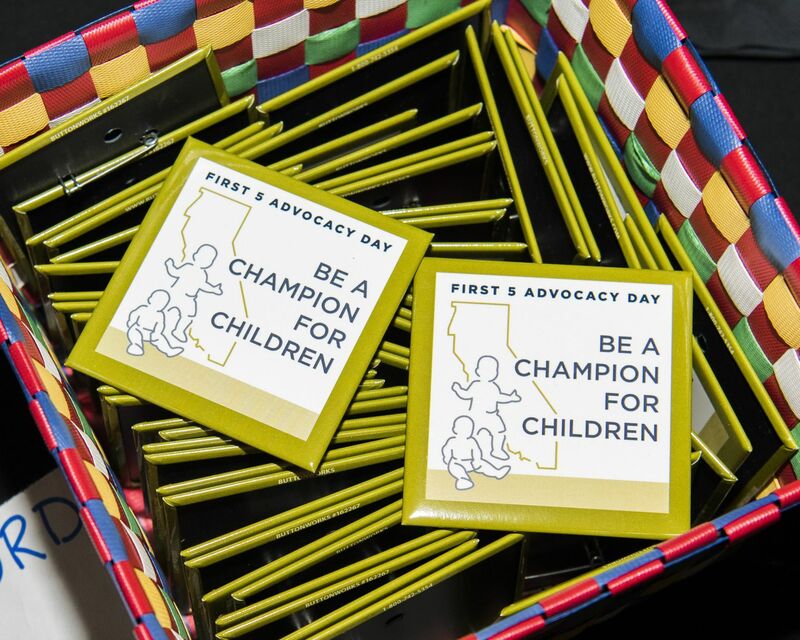 Fortunately, legislative meetings like those during Advocacy Day can make an impact – reminding lawmakers they have experts in early childhood issues to draw upon and who can lend support through their own legislative agendas for the bills proposed by legislators. First 5 LA’s own state legislative agenda, approved by the First 5 LA Commission in the spring of each year, provides a focus for the agency to engage in advocacy activities related to First 5 LA policy priorities during the state legislative and budget seasons. Nor is Advocacy Day in Sacramento the only face-to-face meeting with legislators in which First 5 LA is participating. In May, First 5 LA’s policy and advocacy leaders will venture to the nation’s capital to meet with lawmakers there as part of the Los Angeles Area Chamber of Commerce’s annual Access Washington, D.C. event. Perhaps First 5 LA Commissioner Marlene Zepeda summed it up best.